The favorite album of no less an authority than Ultima Thule co-owner Alan Freeman (who also wrote the crucial krautrock encyclopedia The Crack In The Cosmic Egg), A Meditation Mass is a German kosmische rock klassik. It’s a product from that insanely fecund time when German freaks sought myriad ways to bust out of Anglo-American rock’s standard operating procedures. Which means that Yatha Sidhra’s Meditation Mass—ushered into existence partially thanks to experimental guitarist Achim Reichel’s publishing company, Gorilla Musik—shrugged off trad rock’s blues roots and explored a looser, more outward-bound strain of sonic journeying. Led by brothers Rolf and Klaus Fichter, Yatha Sidhra deployed Moog, flute, vibes, electric piano, guitars, drums, and bass to cast their elongated spells over this four-part Meditation Mass. The nearly 18-minute part 1 calmly unfolds electric guitar spirals, peaceful flute wisps, and gently tumbling drums in the vein of Pink Floyd’s “Set The Controls For The Heart Of The Sun,” but this is even more laid-back. The unhurried pace and contemplative aura thoroughly ease your mind, inducing a heightened sense of well-being. Part 2—by far the shortest section at three minutes—could be the radio track, ja? It begins as a stolid, melancholy trudge, then shifts into an uptempo Soft Machine-like prog-jazz canter. Sadly, only in a much more enlightened world would this piece enter the earshot of more than the most serious heads. The 12-minute part 3 picks up where part 2 left off. If you’re into serpentine flute flights in a space-rock context (and who in their right mind isn’t? ), this movement will give your sweet spot goose bumps. It eventually achieves a fiery, jazzy lift-off into Passport-esque complexity and density. Peak moment, for sure. With part 4, Yatha Sidhra attain a cyclical resolution, as the track reverts to the opening segment’s tranquil trance mode. 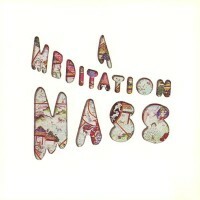 While I don’t rate A Meditation Mass as highly as the good Mr. Freeman does, I do think it’s an outstanding record. Listening to its undulant 40-minute trip, I feel as if I’m gliding toward the vanishing point where the sun drops into the sea, cool breeze tickling my neck hairs, not a goddamn worry in my head.